The book Concrete Ideas: Material to Shape a City was launched in January, 2012. Edited by Pina Petricone, the book considers new approaches to concrete architecture by exploring a variety of new technologies and possibilities for the material. First introduced by Pina’s article in Concrete Toronto, the book is a compilation of ideas, articles and interviews assembled over the past several years. 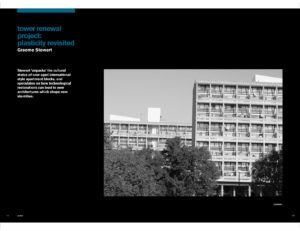 The volume includes exploratory design work by ERA’s Jessie Grebenc, as well as a pair of articles by Graeme Stewart focused on Tower Renewal; one examining the state of concrete tower blocks internationally and the other exploring their potential architectural and urban futures in the Toronto context. Congratulations to Pina and the publication team on a wonderful and beautiful book. Concrete Ideas: Material to Shape a City is available from Thames & Hudson Publishers. For more on concrete, Concrete Toronto can be found here.